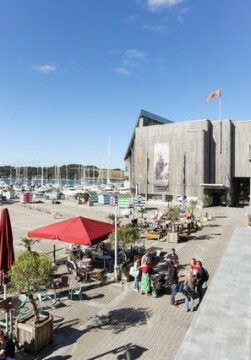 With its location in the heart and soul of Falmouth, Tidemill House apartment is a stunning two bedroom self catered property perfectly situated on the highly renowned Falmouth Events Square. Recently refurbished with contemporary internal stylings this luxurious two bedroom apartment provides spacious open plan living to the highest of standards. 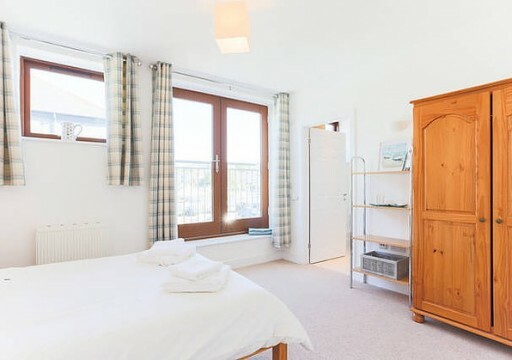 The apartment offers two spacious, light and airy bedrooms sleeping up to four persons. One double en-suite room with Juliet balcony, the second, two single beds and walk in wardrobe and a luxury black slate tiled family bathroom. With a fabulous open plan kitchen, living and dining area with wooden flooring throughout, dining table and large breakfast bar this beautiful living space turns dining- in into a luxury. The living space provides a large 3 piece sofa and arm chair, complete with TV and music player. 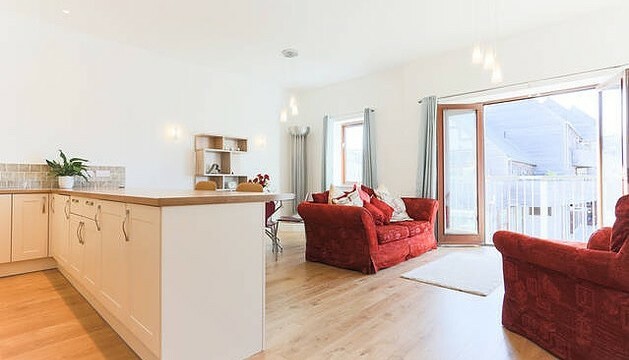 From here double doors lead out onto a beautiful decked balcony where you can open wide the doors and enjoy the long summer nights and fresh sea air, whilst soaking in the stunning elevated views over Falmouth Marina and out to sea.